There is nothing like the thrill of watching your first born cross a stage to receive their diploma at college graduation. You can pretend that it is all part of the parental experience and not such a big deal, until arena fills and the band starts playing and you see all those decorated caps and sea of gowns and realize, wow, that is my kid in that crowd of graduates. She made it. We made it. And then there is that moment when you think, What has she really learned? What has this place given her that will carry her through life? Not the academics or the GPA, but the real stuff. The things that will help her become the type of person she wants to be. 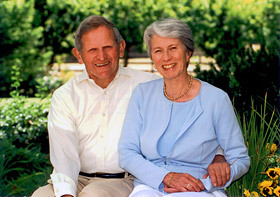 Enter the charming and playful John and Tashia Morgridge. John Morgridge, chair emeritus of the board of Cisco Systems, and Tashia Morgridge, a special education teacher who in retirement volunteers as a teacher for the learning disabled, have made a major impact on the UW campus through their giving. We were so very fortunate to not only hear them make the commencement speech (together… how cool is that? ), but to find out about a unique challenge that they put out to the graduating class. They have created a matching gift program. The goal of their new pledge is for 15 percent of the Class of 2011 to make a gift. That would be 975 students from among the 6,500 graduates. Through Dec. 31, the Morgridges will match gifts ranging from $20.11 to $120.11 to support a graduate’s college, school or department, or the university at large. Pledges can be made online here. As I heard them encourage this class to give back to their Alma Mater I realized that THIS is that impact I as thinking of. Highly successful Alumni not only giving back, but teaching the next generation how to do so as well. Leading by example and most importantly making the ability to give accessible by keeping the donation amount low, then doubling its impact with the matching pledge. Thank you to the Morgridges, for both being such avid supporters of UW and the added bonus of teaching this generation how to follow your example.